For other uses, see Rifa'i (disambiguation). 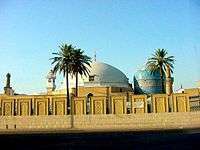 The Rifa'i order / tariqa (also Rufa'i, Rifa'iyya,Rifa'iya) (Arabic, الرفاعية) is an eminent Sufi order founded by Ahmed ar-Rifa'i and developed in the Lower Iraq marshlands between Wasit and Basra. The Rifa'iyya had its greatest following until the 15th century C.E. when it was overtaken by the Qadiri order. The order is said to wield particular influence in Cairo, Egypt. The Rifa'i order is most commonly found in the Arab Middle East but also in Turkey, the Balkans and South Asia. Records indicate Ahmad al-Rifa'i inherited his maternal uncle's, Mansur al-Bata'ihi, position of headship to his religious community in 1145-6 C.E. At this time many followed his activities in and around the village of Umm 'Ubayda. In the Lower Iraq marshlands, the Rifa'i order developed and gained notice throughout the 12th century C.E. due to its extravagant practices. Rifa'i expanded into Egypt and Syria. In 1268 C.E., Abu Muhammad 'Ali al-Hariri formed the Syrian branch of the order which became known as the Haririya. The Rifa'i gained further popularity in Egypt and Turkey. In the 15th century C.E., its popularity waned and the popularity of the Qadiriyya order rose. Subsequently, interest in the Rifa'i order centered within Arab lands. The order has a presence in Syria and Egypt and plays a noticeable role in Kosovo and Albania. The Rifa'i Tariqa blends worship styles or ideas with those of other orders that predominate in the local area. For example, the group established by Ken'an Rifa'i in Istanbul that reflects elements of the Mevlevi Order, while more rural Turkish Rifa'is have absorbed significant influence from the Alevi/Bektashi tradition. The order spread into Anatolia during the 14th and 15th Centuries and ibn Battuta noted Rifa'i 'tekkes' in central Anatolia. 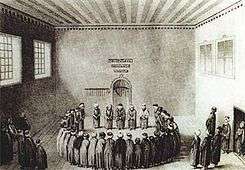 The order however, began to make progress in Turkey during the 17th to 19th centuries when tekkes began to be found in Istanbul. The order spread into the Balkans (especially Bosnia, where they are still present), modern day Albania and Kosovo. In the United States and Canada tekkes (lodges) are found in Staten Island and Toronto that were under the guidance of the late Shaykh Xhemali Shehu (d.2004) of Prizren, Kosovo. Each of these orders is ultimately Turkish in origin. The original Rifai order has many imitators. For example, the Islamic Sufi Order of Qadiri Rifai Tariqa of the Americas has been a legally registered non-profit organization since 1996 although in essence it is not a duly recognized entity among real Sufis. This order has students and branches in Australia, Germany, UK, South Africa, and Mauritius. The self-proclaimed head of the order, Taner Ansari travels worldwide attending conferences, giving discourses, and has written many books. The order has its center established in Nassau, New York. During heightened states, Rifa'i followers were noted to have eaten live snakes, entered ovens filled with fire and ridden on lions. Followers were also noted to have practiced charming snakes and thrusting iron spikes and glass into their bodies. It is uncertain whether or not Ahmed ar-Rifa'i instituted the practices that helped solidify the Rifa'i order's massive popularity. While some scholars attribute these practices to al-Rifa'i, other scholars contend he was unaware of these practices and that these were introduced after the Mongol invasion. ↑ Margoliouth 1997, pp. 38-39. ↑ Trimingham 1998, p. 39. ↑ Trimingham 1998, p. 40. ↑ "501c3Lookup - ISLAMIC SUFI ORDER OF QADIRI RIFAI TARIQA OF THE AMERICAS". 501c3Lookup. ↑ "Sufism, Sufis, and Sufi Orders: Sufism's Many Paths". islam.uga.edu. Retrieved 2015-12-27. ↑ Trimingham 1998, p. 38. ↑ Trimingham 1998, p. 37. Bosworth, Clifford Edmund (1997). Rifa'iyya. The Encyclopaedia of Islam. Brill. ISBN 978-90-04-10422-8. Margoliouth, D.S (1997). Bosworth, Clifford Edmund, ed. al-Rifa'i b. 'Ali, Abu 'l-Abbas. The Encyclopaedia of Islam. Brill. ISBN 978-90-04-10422-8. Trimingham, Beirut J. Spencer (19 May 1998). The Sufi Orders in Islam. Oxford University Press, USA. ISBN 978-0-19-802823-9.